Teaching my kids how to work is a huge priority for me. In today’s world with busy schedules and so many kids focused on screens, it’s hard to find the right way to instill a hard work ethic. I’ve tried so many different methods to try to encourage my kids to be hard workers. Many of those methods have failed, but the method we are using right now has been going strong for 5 years. That’s definitely a record in my house! I don’t know if it is teaching them the hard work ethic I desire, but I know it has been teaching them a lot about household chores and so I am happy with it! 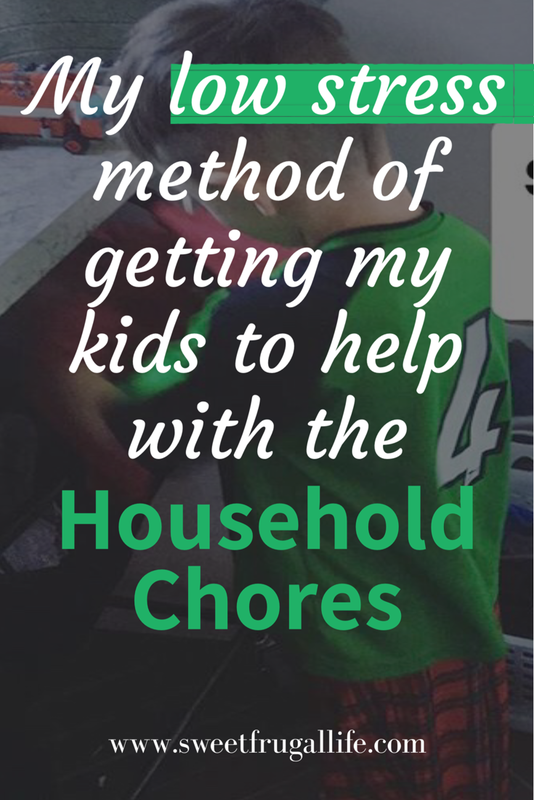 My kids have 4 main household chores that they are responsible for each week. The kids’ bedrooms are expected to daily be kept clean and tidy, including making their bed each day. This usually only takes 5 minutes each morning, sometimes more or less. Once a week they are required to vacuum and clean their rooms. I always check on Saturdays to make sure they did what was asked of them and to verify that they haven’t stuffed anything under the bed or in their closets. 😉 One of my printables includes our Bedroom Responsibilities chart. This is hung up in each of my kids rooms so they can make sure the chores are completed correctly. We have three “Dish Duties” that we rotate each week between our three kids. These duties are: Load the Dishwasher, Sweep the Floor, and Wipe the Counters. After our nightly dinner the family all cleans up the dishes together with the kids each helping with their specific assignment. Each week my kids are assigned a Household Chore. The Household Chore is usually centered around a room in the house; one that the entire family uses, so we all need to help keep it clean. These chores are rotated each week through each of the kids. 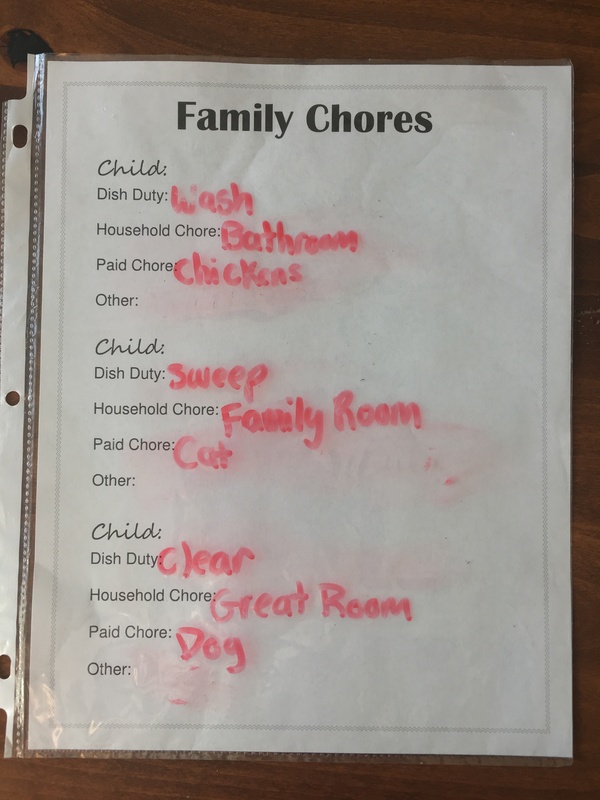 These household chores are rotated weekly between each child. This way everyone gets an equal amount of turns with each chore. I assign my kids one paid chore each month. (other paid chores are given when they request it). Our paid chores revolve around taking care of our animals (six chickens, one dog and one cat). They will ONLY get paid if the chore is completed. These chores are rotated monthly and the kids are paid monthly. You can read my article Teaching Kids Smart Money Habits to learn more about my views on giving kids an allowance. This is how we do chores in our house. Are my kids perfect? No way! Am I perfect? Not even close! But, we are trying. And for now, this is what has been working for us. 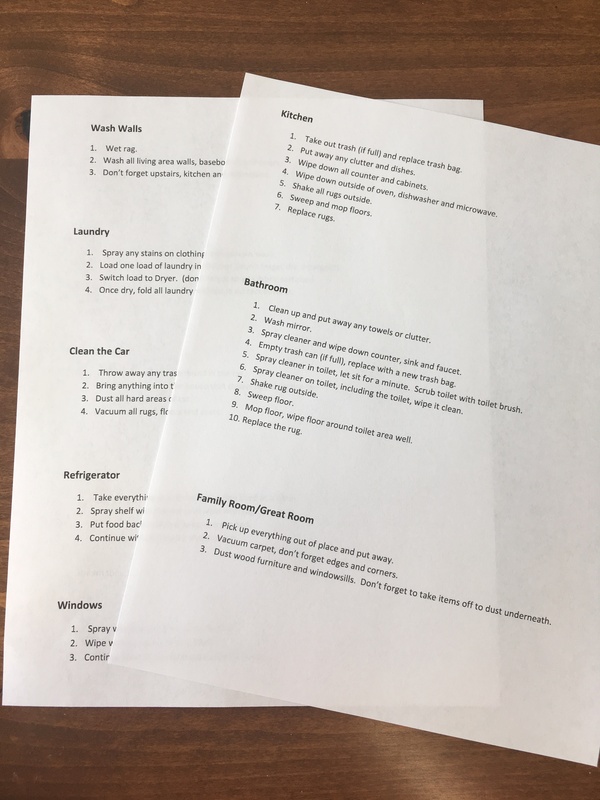 I have turned my Family Chore Chart and Chore Responsibilities into free printables for you! These are the exact charts we use! 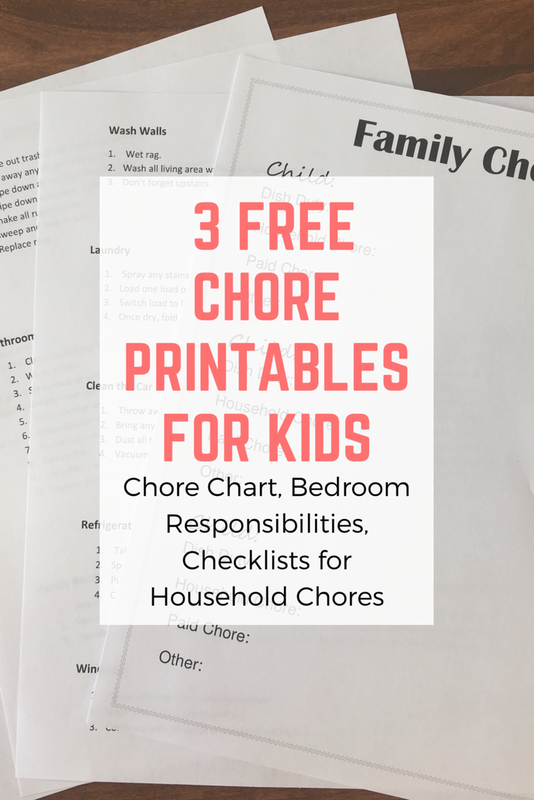 You can get them emailed to you by following this link: Free Chores for Kids Printables. 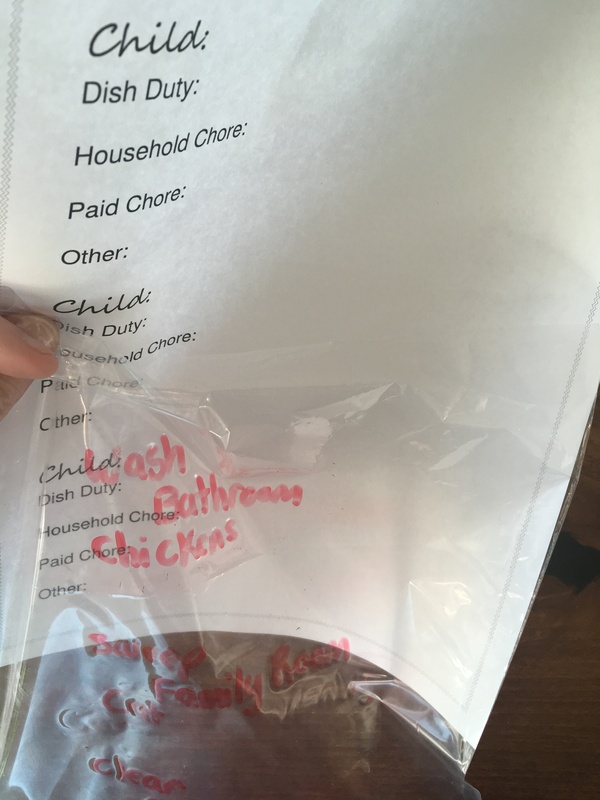 I highly suggest laminating the Family Chore Chart after printing it. Or, you can just stick it in a page protector like I do! 😉 This way I can use a dry erase marker to write down all of the chores and adjust them each week. 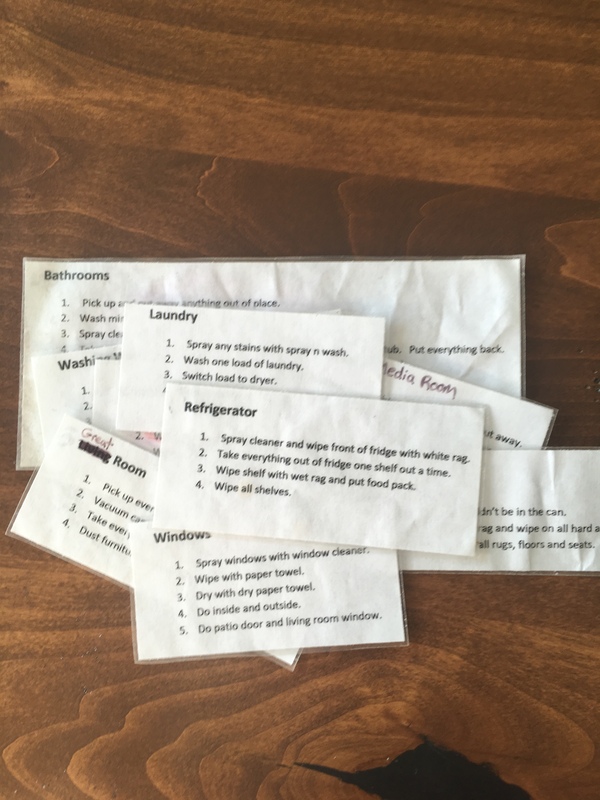 You will want to cut the Clean Chores printables into sections and laminate each section. This is obviously not necessary, but I have found it helps to keep the instructions more durable with my kids use. 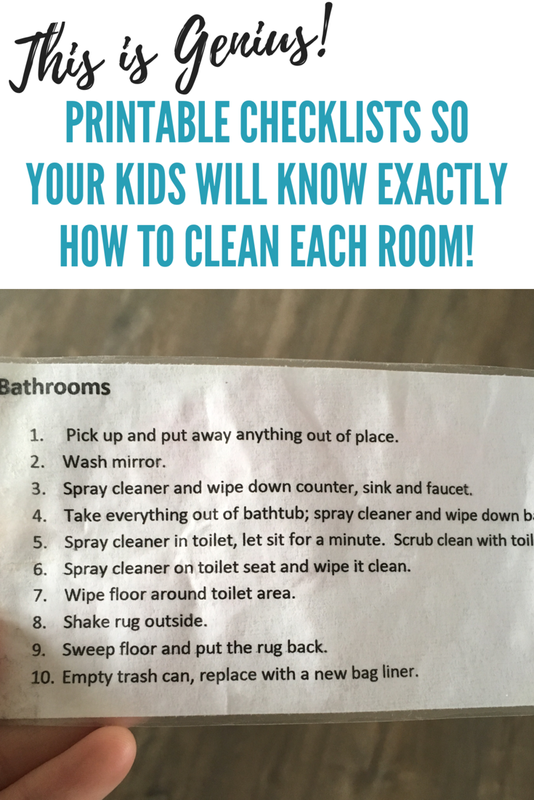 I keep the chore instructions hung up in a bag for my kids to pull out of when it is their turn for that particular chore. I truly believe one of the greatest gifts we can give a child is teaching them how to work. They WILL look back one day and thank you for giving them this gift. I whined and yelled and cried and complained and told my parents they were the meanest in the world…..but I grew up….and I realized just how GRATEFUL I am that they taught me how to work! The saying says there is more than one way to train a horse! That falls true with kids too! This is what works for my kids, you might find something different that works for your family. All that matters is that we are TRYING. Keep trying mamas! We got this!